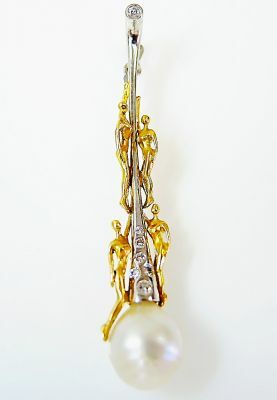 A beautiful modern 18kt yellow and white enhancer pendant with 4 yellow gold female figures along the stem of the enhancer pendant, featuring 1 silvery gray baroque pearl, approx. 13.28 x 10.56mm and 7 round brilliant cut diamonds, est. 0.16ct (clarity:VS & F-G colour).